Whether you choose to use Diamond Sliced Almonds as a garnish or an ingredient, you'll find that Diamond Almonds add an elegance to salads, entrees, side dishes and desserts. Always reach for Diamond Premium Almonds for the highest quality, freshness and value. 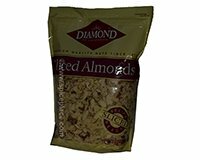 Diamond Almonds, the world;'s favorite since 1912. For extra freshness, store almonds in a sealed container in refrigerator. Package contains about 8 cups of sliced almonds. Almonds take on greater flavor depth and a crispier, crunchier texture when they're toasted. Spread sliced almonds in a single layer on a baking sheet or in a shallow pan. Bake, stirring once or twice, until lightly browned and fragrant, about 5 to 10 minutes. Allergy Information: Manufactured on shared equipment, may contain other tree nuts, peanuts, wheat, soy, milk, sesame seeds. May contain shell pieces.